Ready for cooler weather, jumper made from a chenille bedspread is just right. 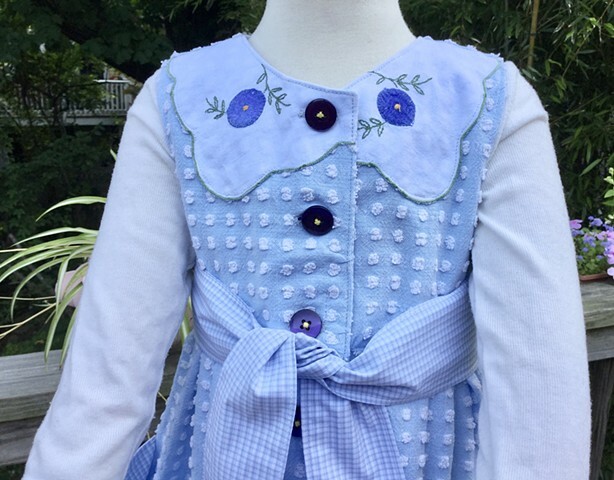 Easily paired with leggings, long-sleeve tee or turtleneck, buttons down the front for easy on-off, enhanced with blue gingham bodice lining, pockets and sash. Special embroidered linens on yokes and pockets, big pleated skirt, original fringe. Sized for L (5-6 years), measures 24” across waist, 24” shoulder to hem, $90. 100% cotton, made by the designer herself and shipped free to any address in the U.S. #262.